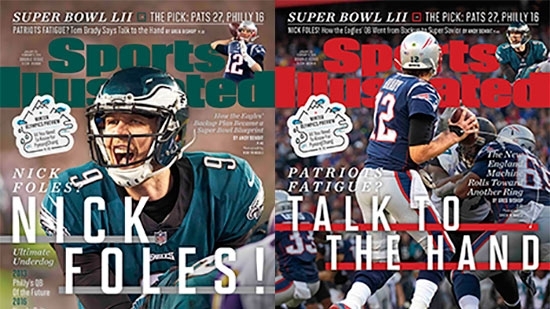 Sports Illustrated released two covers of their magazine covering Super Bowl LII. One features New England Patriots quarterback Tom Brady. The other features Philadelphia Eagles quarterback Nick Foles. Foles is described as the Ultimate Underdog, going from backup to playoff starter twice and now the big game. SI is also picking the Pats 27-16 over the Birds. Also, on Tuesday the Patriots chose to wear their white road jerseys. The Eagles will wear midnight green. The northbound lanes of I-95 in Delaware County have reopened after an earlier accident involving a pedestrian. It happened after 12:30 p.m. near exit 2 in Upper Chichester Township. A person was struck by a car. All lanes were shut down at one point. No other details are known at this point including the condition of the pedestrian. Police are still investigating the cause of the accident. A 19-year-old man was shot and killed in Philadelphia's Olney section early Tuesday morning. It happened around 12:30 a.m. near Broad and Olney. Officers from the 35th district responded to reports of gunfire on the 1300 blocks of Olney Ave. They found shell casings but no victim. The teen had been driven to Einstein Hospital a few blocks away by private vehicle. He had emergency surgery but died a few hours later. Investigators determined he had been shot four times in the back, chest, and right arm while standing at SEPTA’s Olney Transportation Center. They are looking into nearby surveillance cameras for video of the shooting.